I love bananas. Plain, in yogurt, dipped in chocolate, smothered in peanut butter, in a cake. You get the point. 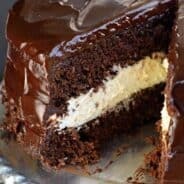 This cake is so moist, you will be pleasantly surprised. 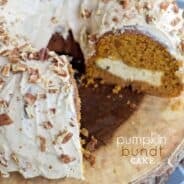 Frost it with my cinnamon buttercream and you won’t want to share! 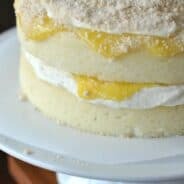 But you will share, because this is the perfect cake to make mom for Mother’s Day! Don’t forget to make her a batch of Meringue Rose Cookies too! Grease and flour two 9inch cake pans. I line the bottom with parchment paper as well. Set aside. For the cake, blend butter and sugar until creamy. Add egg and vanilla, beat until combined. Blend in bananas (you can mash them first, but I just toss them in my kitchenaid and it does the work for me). Add in flour, baking powder, baking soda and salt. Divide batter in half and pour into cake pans. Bake in a 350 degree oven for 25 minutes. Remove and cool. Let cake cool in pans 10 minutes, then flip onto a cooling rack to cool completely. For the frosting, beat butter until fluffy. Add in powdered sugar and cinnamon. Add milk. Beat for 5 minutes until desired consistency. To frost cake. Lay one layer of cake on cake plate. Spoon frosting over layer and smooth. Top with second layer of cake. Again spoon frosting on top and smooth. Using a spatula, spread frosting around the sides of the cake. Slice and serve! If you want to have your cakes flat, you could slice off the tops. However, I used Wilton Bake even Cake Strips. You wrap them around your pans and your cakes bake even! Go figure! So delicious! Can I swim in that frosting? I want a slice of this so bad Aimee. Looks great! That cake looks terrific. I love banana anything! Come visit us. We have a wonderful Brie panini this week. Two peas in a pod…except that I like to eat my bananas green:-) I too have a love affair with bananas and find myself putting them into everything. I would love a huge slice of this yummy cake…and cinnamon buttercream oh yeah!!!! WOW, it looks so good. I love banana’s too. I’m trying to do no carbs right now (40th reunion coming up), but as soon as that’s over, I’m doing this! Looks wonderful and my mouth is watering. Yum! What a great recipe! It looks amazing!! I want a slice right now!! I love bannanas with peanut butter also! This cake looks dreamy! Love it! 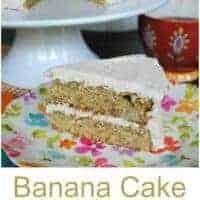 I love the combination of flavors; banana cake and cinnamon frosting. Great choice. 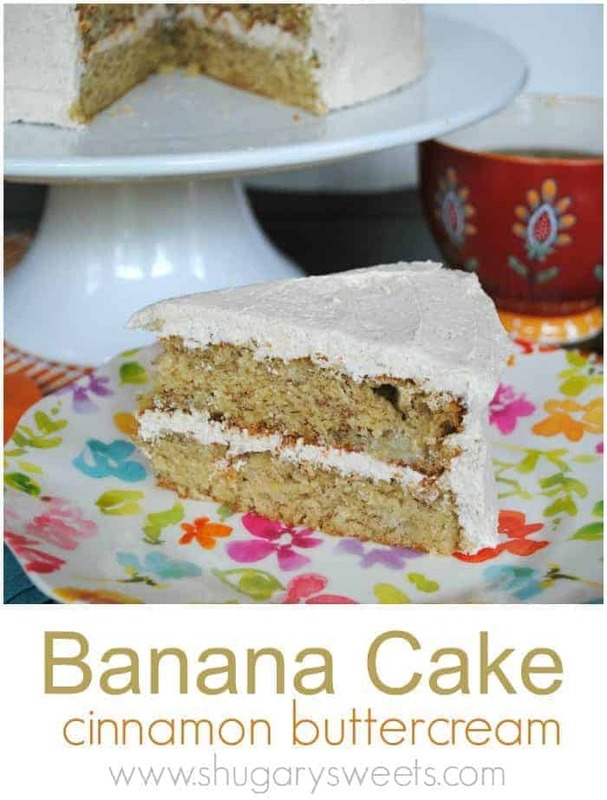 ♥ me some banana cake! YUM! This looks wonderful. Thanks for sharing at this week’s BFF Open House! Oh my goodness! This cake looks delicious! Thanks for sharing your recipe! Visiting from Sunday Blog Hop! What a yummy blog! I am a new follower from the blog hop. I look forward to trying some of your goodies! I never ever thought of cinnamon icing, but I LOVE that idea. I’m going to make it sometime. Can this be made in a 9X13 pan? If so how long? I have a bunch of ripe bananas I need to use up! Just baked 6 pumpkin rolls last night. Now I need to use the bananas up! This cake is amazing! I just made it and had to reviews it. It’s smells like banana heaven and I added cinnamon to it just because I love the combo of cinnamon and bananas. I’m guessing it taste as amazing as it smells. I made it for my moms birthday tomorrow. I hope she loves it! Hi there! Do you know if this can be made the day before? I’m thinking of making it for a party but am trying to limit day-of baking. Thanks! Yes, absolutely. The frosting will keep the cake moist. Just keep it in a cake server or covered with plastic wrap!